Set in a swanky New York apartment in 1948, Hitchcock’s first colour film opens with a pair of well-to-do men murdering their friend. They stuff the man’s corpse in a trunk before presenting a buffet on it for their high society pals. Can they make it through the party without giving themselves away? Aside from the questionable logic of inviting the victim’s friends and family round immediately after a well-planned murder, this is a masterclass in self contained suspense. Based on a play, the confined nature of this story both in setting and length means the focus is completely and utterly on the actors, dialogue and performances. It this sense it’s very much like Hitchcock’s 1954 picture Dial M for Murder, which similarly takes place in one apartment in the aftermath of a killing, although Rope reaches heights of suspense beyond that of the later film. Rope is also distinct in the unique way it’s shot, with the camera hardly cutting throughout the duration of the film. Because of the limited length of a film reel in those days, Hitchcock has to find innovative ways of cutting without taking the camera off its subject. This is a neat idea, even if it does result in some strange shots of the picture being completely obscured by someone’s body. 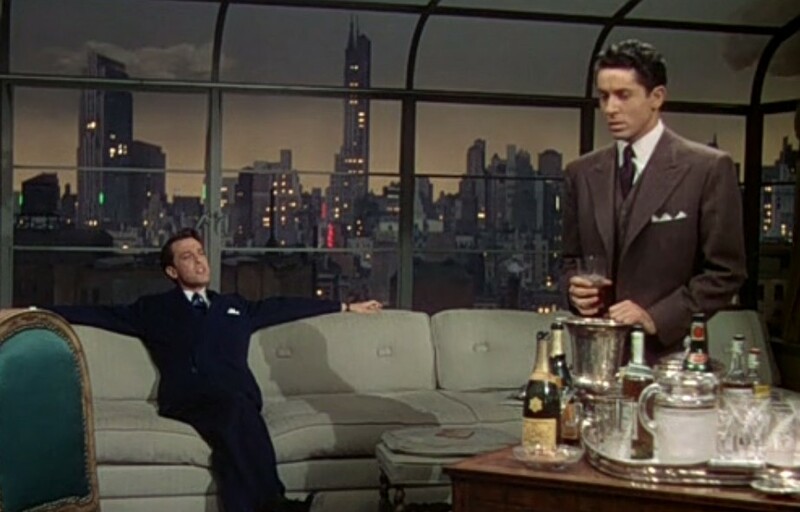 The best scenes involve James Stewart as the murderers’ friend Rupert, the sharpest of this privileged bunch, as he presses the pair on the absence of their friend David. It’s impressive how much suspense is built into these scenes without the use of editing tricks or non diegetic music. One conversation during the evening feels particularly satirical, as several characters speculate on the right of the “intellectually superior” to kill people should they so choose. With its biting attack on the attitude of high society this feels akin to American Psycho, particularly as the room full of people dine off the coffin of their friend in complete ignorance. This film is another great Hitchcock classic which packs a lot into a small space. I’ll have to look out for this Hitchcock film. Watched The Birds the other day as well as Psycho, so I’m getting into Hitchcock films. Great suspense for films over fifty years old and without the benefit of graphic effects and whatnot.